We vomit on all these people who suddenly say they are our friends. The killings at Charlie Hebdo and elsewhere, over the course of the last week in france, have become spectacle, culminating in the multitudinous demonstrations throughout the country, this last Sunday, apparently the largest ever in the country’s history. In response to the tragedy, we were offered a defense of the “Republic” and of the nation united, a celebration of its values and authorities, of freedom of speech and of those who would guarantee it: institutions, politicians, police, all it is claimed duty bound to uphold the law. On this solemn occasion, such noted defenders of freedom as israel’s Benjamin Netanyahu, hungary’s Viktor Orban, spain’s Mariano Rajoy, and the king of jordan were present; it seems that no one could be absent from Paris. They were to join hands with the executors of the european union’s violent theft of public wealth and increased exploitation of labour under the guise of necessary austerity; the same political leaders who contribute to the elaboration of global and economic policies that are responsible for the deaths of thousands, everyday; the same politicians who will now, in the defence of “freedom”, cover us with security measures, systems of surveillance, expedient judicial procedures, exceptional and preventative imprisonment, and wars, endless wars against the omnipresent terrorist. The government of fear will sink its roots even further into our lives and we may so come to desire this security, that freedom and the police may come to be seen as synonymous. And as the rot grows, the symptoms of its sickness will expand: racism, sexism, bigotry, fascisms of all kinds, the very monsters States pretend to fight against. To the State appropriation of the grand demonstrations and their various media incarnations, only one response was fitting, to ignore it, or to ridicule and satirise it, and to remember that Charlie Hebdo was none of this. 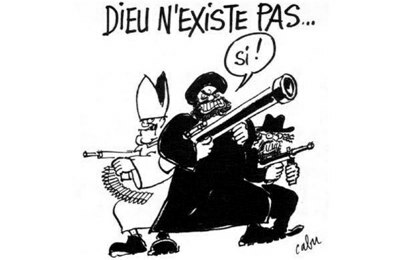 What we celebrate of Charlie Hebdo’s past and what we mourn today is the passing of the laughter of the child who points to the king and declares in a loud voice: “The king is naked!” And there is still much reason for laughter. 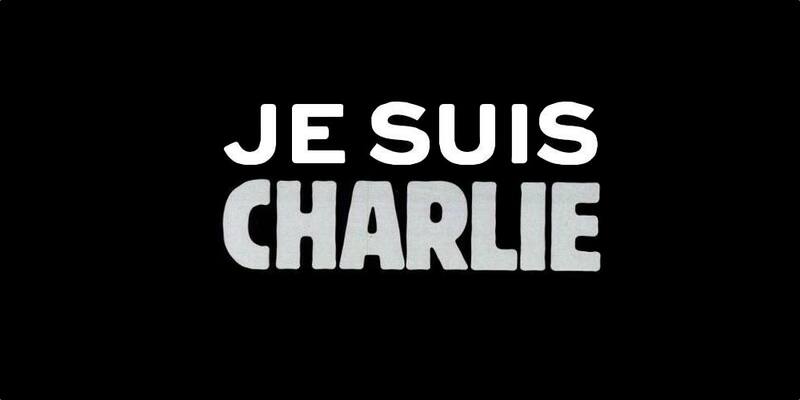 The carnage at the offices of Charlie Hebdo has sparked a wave of indignation and anger perfectly legitimate that we share. We condemn without reservation the massacre that aims to sow terror and to silence journalists who defend the freedom of expression. We condemn with equal vigor the murderous anti-Semitic violence unleashed against the customers of a kosher supermarket at the porte de Vincennes. Our thoughts go first to all of the relatives of the victims and we express our full support to them. These attacks are the work of religious fascists who dream of imposing their deadly illusions on society. We must be very clear in condemning without reservation this fanaticism. We fight all forms of fascism, whether they thrive on the basis nationalism or obscurantism, and whoever may be their guides or prophets. They want to terrorize, deliberately provoke horror and fear, to create a situation of extreme tension. In this they are fully complicit with the FN and the extreme right. And as we feared, we see now that this massacre serves as a pretext to fuel racist discourse and justify attacks against Muslim places of worship. We hear already the reactionary scribblers and opportunistic politicians take up the dubious theory of the “clash of civilizations” and profit from this event to renew their charges against immigrants, foreigners, Muslims. • The military intervention of France in Iraq, Mali, Central African Republic. The primary goal of these interventions is to protect the imperialist interests of French companies in these regions and the dictators in place, not to fight jihadism, which France did not hesitate to arm in other situations. • A new draconian offensive against freedom. As after 11th of September 2001, the governments in place, under the cover of anti-terrorism, will impose new apparatuses of control, apparatuses that since have shown themselves to be used mainly against political and labour union activists. • The anti-social politics of the government. Surfing on the emotional shock that affects us all, Valls and Hollande on well to hiding their politics of austerity, especially the Macron bill, to be presented to the National Assembly in late January and which proposes a new set of reviews of instruments that defend employees (labor tribunals, labor inspection …), facilitates layoffs, and trivialises and offers lower compensation for night and Sunday work. More generally, among the political forces that today display indignation are largely the same ones responsible for the poisonous atmosphere that is a result of their stigmatisation of immigrant workers and their children, especially when they are supposedly Muslims. This appropriation is even more outrageous given that the murdered journalists of Charlie Hebdo did not hesitate to condemn the policies of Hollande, Sarkozy or Le Pen. If we had to listen to the PS and the UMP, the FN should have been invited to their “republican march” on Sunday. What would the murdered journalists have thought of all this? We regret the transformation of next Sunday’s demonstration, initiated by anti-racist organizations, into “a Republican march”, with Valls as the organizer and Sarkozy among the marchers. Fierce opponents of “national unity” for the reasons described above, we will not participate in the march. It is of the utmost urgency that those who are revolted by this fascist attack and refuse to walk behind Sarkozy and Valls, who want to resist racism and combat discrimination, who oppose the draconian security policies, that they regroup and take the offensive. This entry was posted in Commentary and tagged Charlie Hebdo, france. Bookmark the permalink.